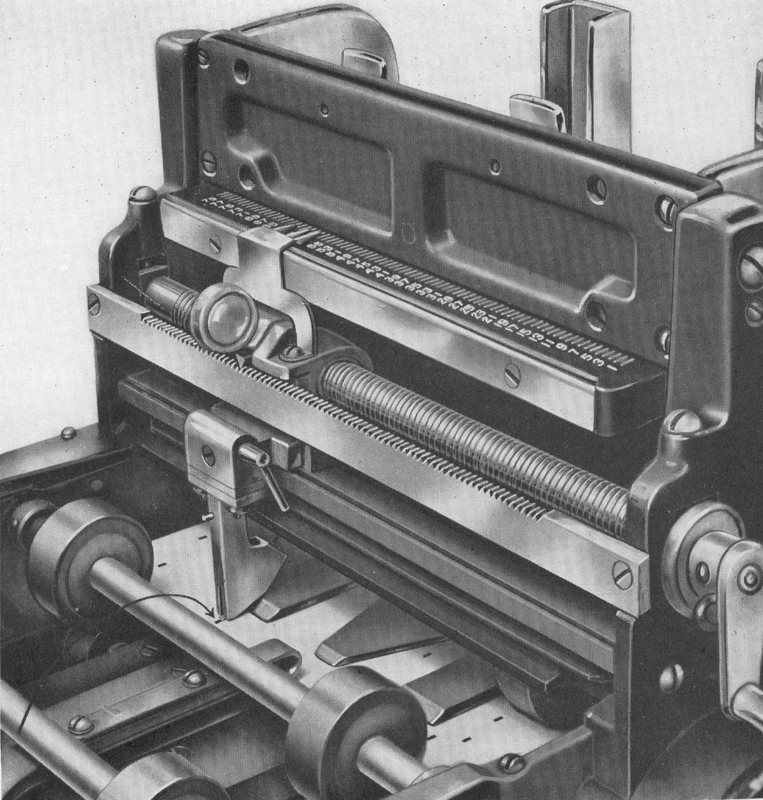 IBM Type 82 Sorter (1949). CLICK IMAGE to magnify. See References below for photo credits. As the manual (Reference 1 below) states, "all accounting systems based upon the use of unit records, whether manual or mechanical, necessitate a sorting or classifying operation. IBM Sorters afford a speedy and accurate method of arranging cards into any desired sequence for the preparation of reports." 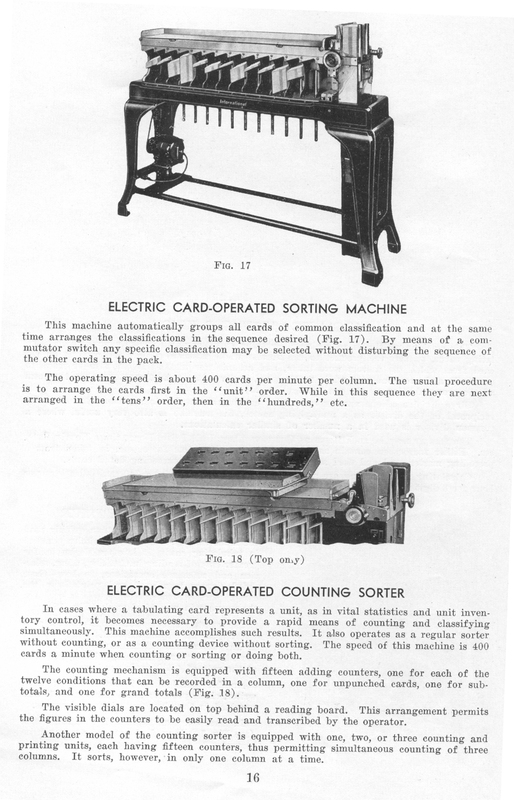 Likewise, sorting played a critical part in the punched card method of scientific computation, for example in accumulating sums of squares by progressive digiting, as described by Eckert in Reference 3 below, pp.31-35, using the IBM Type 75 sorters in his Astronomical Computing Bureau at Columbia University. 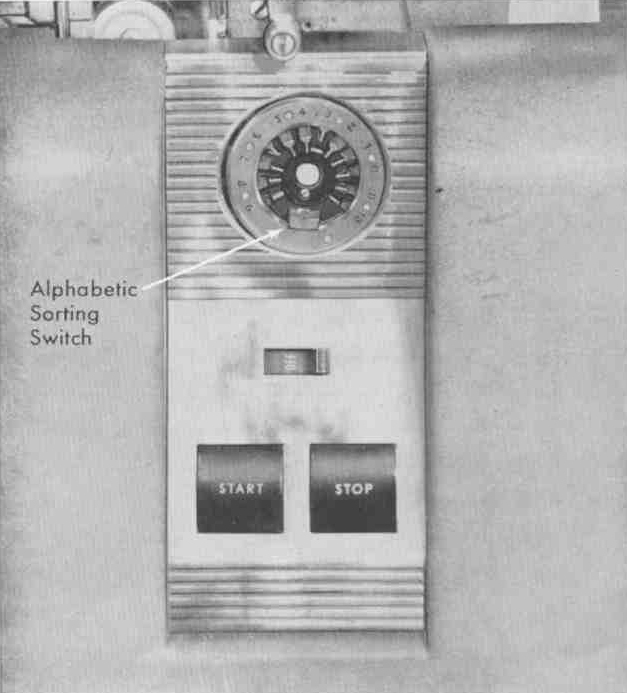 By the 1960s and 70s, when stored-program computers were the rule, but they were still programmed in the batch by punched cards, a more common application for the sorter was to put a dropped card deck back in order. Most serious applications (as opposed to student jobs) punched sequence numbers in card columns 73-80 for exactly this purpose. Compilers and assemblers ignored these columns, or in some cases, treated them as line numbers for listing and error-reporting purposes. You may have heard the story of the operator who dropped a whole box of cards. Wanting to put things right as quickly as possible, he sorted the cards, without consulting the user. As it turned out, that was the worst possible response. Up until that point, the box had contained a sample of random numbers. For some reason, IBM didn't produce a card reader that operated at 2000 cpm. 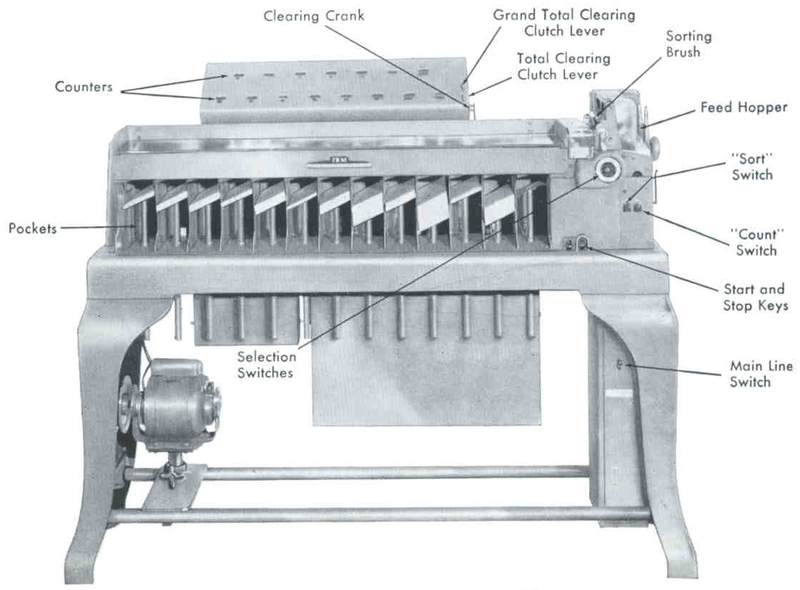 The 084 was unique in that it used a vacuum-assist card-feed mechanism that did not require the use of a card-weight, as the cards were held against the throat and picker knives by suction. 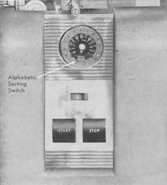 The 084 also used an optical method of detecting card punches instead of the wire brush used by earlier models. The 082 sorter was the first machine CE's received training on when I started with the company in 1966, even though my main assignment was to be with System/360 I/O and CPUs. 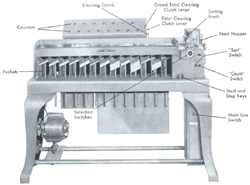 Training on Sorters and Keypunches (024, 026, 029) was standard for CE's. They familiarized everyone with punched-card concepts, and also served as a kind of 'boot camp' to see who would survive into more advanced schools. An interesting historical footnote to the origins of sequence numbers in columns 73-80: This practice started because the on-line card readers for the 704, 709, 7090 and 7094 computers read cards only in 'row binary' format, reading cards row-by-row into 12 pairs of 36-bit words (2x36=72). The reader was not capable of reading more than 72 of the 80 columns of a card, so early compilers and assemblers, such as Fortran and FAP, could only 'see' those 72 columns. Row binary was converted into BCD character codes via software. 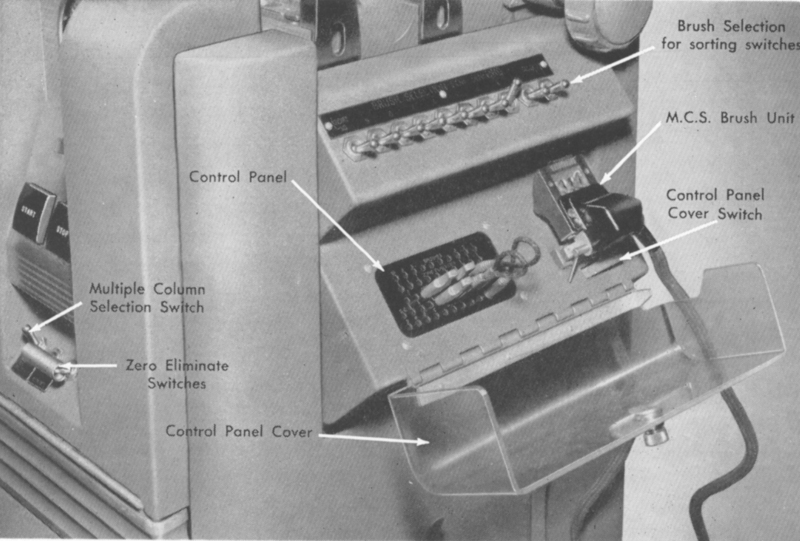 A wire-jumper control panel in the reader selected which 72 columns were input, but of course the 'default' was to use one that was wired for columns 1-72. The remaining columns, being ignored, were a good place to put sequence numbers as 'deck-dropping insurance'. Later systems for source-code maintenance exploited the sequence numbers as a method of identifying card-images, in systems where all 80 columns were readable, such as when jobstreams were transferred from card to tape, typically by using an IBM 1401. 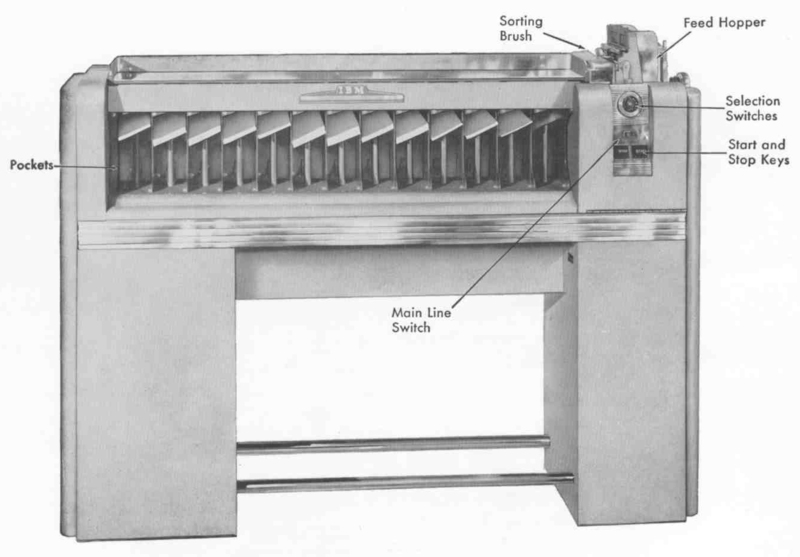 In the course of trawling for material for a talk on the early days of computing in my particular subject area I have just been reading your very helpful material on the IBM 082 sorter (and related mechanical devices). It brought back memories (few of them fond) of wrestling with this beast in the early 1960s. You don't mention it but I wonder whether you ever came across the tip for dealing with a dropped deck of non-sequence-numbered cards. This was always to draw with a soft felt-tip pen one or more diagonal lines across the top of the deck. While this did not give the exact sequence position of every card it reduced the number of possible arrangements from n-factorial to something that just might be manageable. 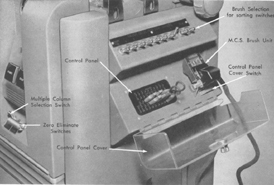 IBM Electric Punched Card Accounting Machines, Principles of Operation: Sorters types 82, 80, and 75; IBM Form 22-3177-1 (1949). All images on this page are from this publication except where noted. 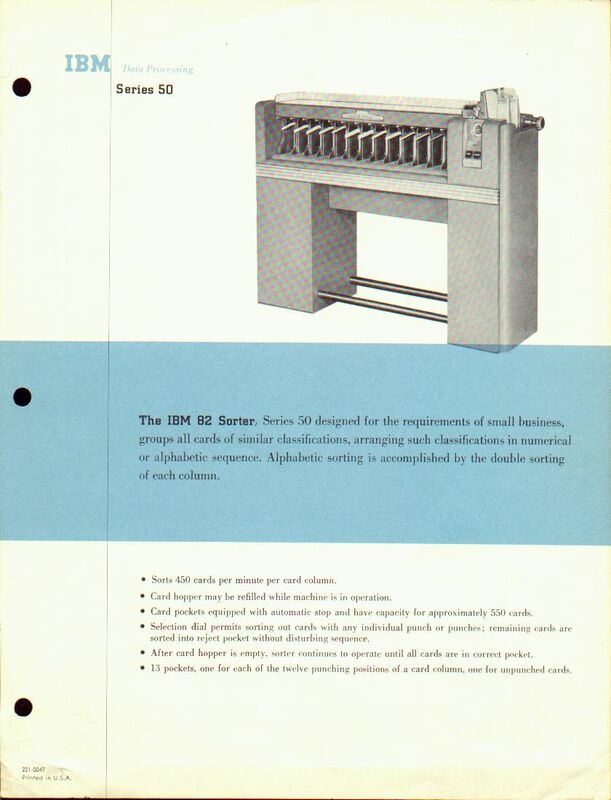 IBM 82, 83, and 84 Sorters, Reference Manual , International Business Machines Corporation, Endicott NY, Form A24-1034-1 (Copyright 1949, 1953, 1957, 1959, 1961, 1962). Baehne, George W. (IBM), Practical Applications of the Punched Card Method in Colleges and Universities , Columbia University Press (1935). The Sorting Brushes image is from this book. Eames, Charles and Ray, A Computer Perspective: Background to the Computer Age , Harvard University Press. First Edition 1973; Second Edition 1990 . The vertical sorter image is from this book. Eckert, W.J., Punched Card Methods in Scientific Computation , The Thomas J. Watson Astronomical Computing Bureau, Columbia University, Lancaster Press, Inc., Lancaster PA (January 1940). Knuth, Donald, The Art of Computer Programming , Vol.3 "Sorting and Searching", Addison-Wesley (1973) ; Section 5.5, pp.382-384: A history of sorters and sorting methods. Another photo of the Type 82 sorter. Columbia Computer Center 1965 Gallery. The Watson Scientific Computing Laboratory , by Ellie Krawitz (1949) . 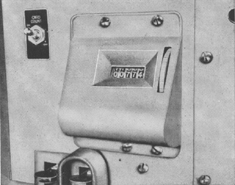 For earlier sorters and other punched-card equipment, see the plates from the Baehne book (1935). For even earlier punched-cade equipment and mechanical calculators, see the MNRAS plates (1928-32). Offsite: Towards the First Modern Computers (York University Science and Technology Studies, History of Computing and Information Technology, Lecture 15). Also See: Tabulators, Key Punches, Collators, Reproducers, Interpreters, Calculators.